The Mist and 1408 are two of my favourite Stephen King works, and undoubtedly two of the best horror movie adaptations from a work belonging to the horror genre. As my journey to Munnar is concerned, it had both; there was the mist which blocked the view as if to let those creature from the other world gain entry undetected by the mortals, as well as the number 1408, on a white car’s number plate which wasn’t clearly noticed in the fog; it could have been an Alto or a slightly bigger four-legged monster of the mist, but one can’t be that sure with an eye which had not only the fog, but also the rain to fight with. I could not still feel that it was the beginning or Armageddon or a failed scientific experiment; there could not have contact with another dimension of the world or another alien species as it should have been more convincing of inferno in that case. Still, the car number 1408 could have been more significant in adding to a certain horror effect, but that would have been for the people enclosed in that particular room which is a four-wheeler in this case. This one surely didn’t hit a dead end and the ending was a happy one; no loss – not even the loss of imagination or fancy. I don’t know if it could have satisfied Stephen King into a novel, as the Coonoor-Ooty trip had a more novel-inspiring background, except for the mist, and this one would just inspire poetry and philosophy. 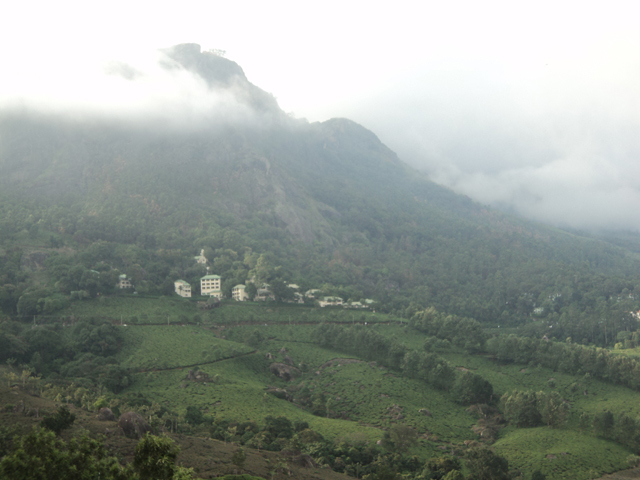 As The Mist had thunderstorms and 1408 had internal thunderstorms, the same was what existed at Munnar, but at a significantly lower rate and for a much lesser period of time. The creature which came close to making that mist an event of alien invasion was a honey bee who tried to tresspass into human territory through the window, and the closest thing which came closer to creating a 1408 effect by that car was when it came that near our car and also the rest of the four-wheelers around – thus lacked the intensity of the room by a thousand miles. The mankind’s tampering with nature and the work against God’s will might make a horror effect sooner or later, but not during that time. At that moment, photography was the more important thing. The mist that created the mystery feeling had to be a significant part of each photo taken during that one hour or two, mostly because of the fact that nothing much was visible during that time from a distance. All these would change on the very next day though, as the view without this fog would be of lots of greenery and mountainous areas all around, with trees and plants which made an impact complimenting the rocks in the photos. This was the journey from Munnar to Chinnakanal, through the smaller roads with tea plantations on both sides along with all the features of an area higher than the high ranges. For a journey which started with mist and the number 1408, it had to be that much of a success with three times the box-office collection compared to its cost like The Mist, or even five times the production cost like 1408 with 73% critical rating like the former or even 78% of critical approval like the latter – or at least living upto the IMDB user rating of 7.3 or 6.8, possibly somewhere in between. There would be no stars like John Cusak, Samuel Jackson or Laurie Holden, and the trip still had to be a good story to talk about. To be frank, it was a trip close to perfection, still not extremely close enough. The journey was so much similar to the Ooty-Coonoor trip, as there were the mountains, greenery and twisted roads throughout the path, and tea was obviously the most common thing. Munnar seemed to have more tea plantations around – it was thus for the human eye, but there were less tea factories and outlets to visit; wonder Tata is not interested in letting people into their factories as their smell would ruin the taste of tea. There was the tea museum, but it was closed on Monday and it was that day of the week which made sure that Tata experiences are basically not that good for me, whether it was with my Tata Indica, Tata Indicom phone connection, Tata Photon Plus internet connection or even a Tata Nano which I might have bought, but I didn’t. It was almost like everything belonged to Tata, but none of use to me. A comparison with the other recently visited hill stations like Ooty, Coonoor, Kandy and Nuwara Eliya would prove this trip different just because the presence of both heavy rain and powerful fog which were missing at the other places. It is probably something which could have occured the other way around, but this situation just made Munnar much cooler than expected and falling in temperature compared to my last two visits which happened about six or seven years ago and before that, within the same time gap. Before reaching the land of three rivers, this time there was a stop at Adimali, as there was the church and Rosary Park which added the spiritual feeling for a journey to the clouds. There were also other churches on the roadside itself, and surrounded by greenery, they might be the perfect worship places. The CSI Christ Church and Mount Carmel Catholic Church are the two church structures in the town which adds to the spiritual beauty and combines it with the physical factors. The former is a small, but marvellous structure which would seem older than it really is; the mostly-stone building and its painted windows are joy to watch. The latter looks as old as it might be, and is located at a higher ground just like the former, adding to its age is its simplicity which would suit a spiritual centre located so close to nature. The journey from Munnar to Chinnakanal was surely the best part, with tea plantations all around and the fog which reminded me about The Mist – still what would come to mind more than tea on that occasion? It was the time to be close with tea even before it was really tea; it was the time to take photos surrounded by tea leaves as if it was home; after all, home is where the heart is – as some would say. Drinking tea was the next big thing – the advantage of being at most of the hill stations is surely about drinking great tea, as proven at Ooty and Coonoor, even as places like Ceylon has good tea throughout; blessed are the tea leaves which bring the best for the mortals – something for which Tata has to be applauded, even as this is just something which was not started by them but by the Chinese. Sometimes, the peace of Devikulam also comes to the mind; Chinnakanal is no less peaceful an area though even if there are too many resorts around. But the same cannot be always said about Mattupetty, as it turned out to be a little noisy and dirty and not that much of a treat to the aesthetic sense as it used to be. The Indo-Swiss Project and the Masonry Dam still looked fine, but other than that, there seemed to be an eclipse, including the lake itself and all the waste which seemed to surround the water body which used to be more beautiful. Eravikulam National Park would live to be visited another day considering the time which was to be spent there. Anayirangal Dam didn’t have much to boast about and so was the closed waterfall at Chinnakanal. Both were like the tragic failures of that journey. The tragedies were to be forgotten by more tea and the homemade chocolates, especially the white ones and a few dark ones for a change. I would watch The Mist and 1408 to add to it soon. The objective co-relative might not be invoked yet, but there is still that connection which lies beneath the viewable surface of the mortal world. It is to this connection that all the compasses would point to, and it is that vision of those direction markers which would guide me with that particular way of thinking which fills my mind. There is no need for any supporting navigator the stars to be the guide, as there was none at Munnar, Ooty or Coonoor – the journey was always better with no unnecessary guidance. Munnar will be the same town, no matter how much one plans – at the end of the day, the tourist attractions which one ends up looking at might be just the same, supported by a guide or a guide book; the journey takes the mortal everywhere as if he was destined to be there.